When you make a purchase from a mobile device, you’re engaging in Mobile Commerce. 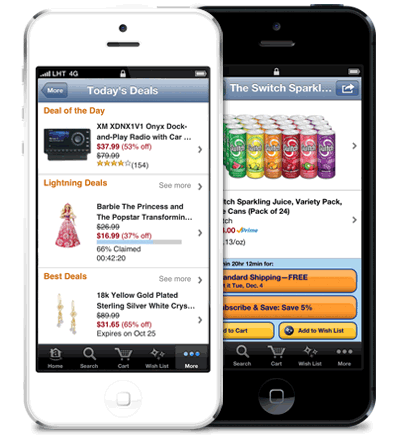 Mobile Commerce, or M-Commerce, is to your smartphone or tablet as E-Commerce is to your laptop or desktop. With smartphones having made their way into the hands of 50% of Americans as of the new year, and tablet ownership at 33% among Americans, I bet you’re thinking that M-Commerce must be the next big thing on everyone’s mind. Well guess again, despite the massive amount of success garnered through M-Commerce by online marketplace giants Amazon and eBay, M-Commerce activity only makes up a dismal 1.5% of online sales for most retailers, according to a recent report by Forrester. So why is this slice of total online sales so small? The first is attributed to the nature of smartphones. Despite the massive (and growing) utility Americans derive from their mobile devices, online purchases are generally not a task that you need to, or would generally want to make from a smartphone. The screen size is smaller than what would be considered optimal, and product visuals on this smaller screen might not do it for most online shoppers. In this instance, it’s usually preferable to just wait until you’re by your laptop or desktop, or even your tablet, to make any purchases. The second is mainly the result of the web app and mobile app checkout processes. While PayPal Express or Checkout by Amazon feature streamlined purchasing processes optimized for mobile devices, most retailers have not made these systems accessible through their web apps or mobile apps. Though despite the current shortcomings, many retailers are wondering if now is the time to begin investing in M-Commerce. The answer is yes, now is absolutely the right time. 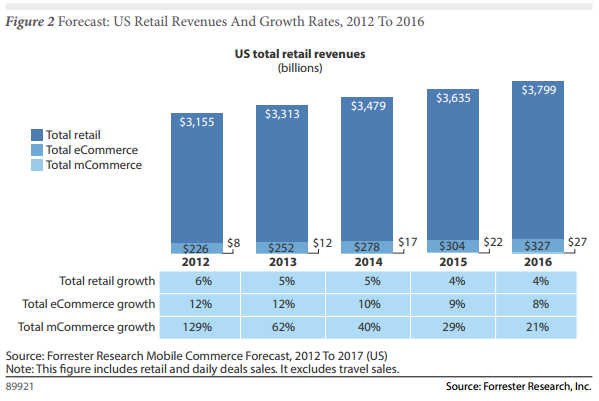 The Forrester report continues to map out total U.S retail revenue over the upcoming four years, through the end of 2016. According to the report, total mobile sales are slated to rise 33% over this time span, reaching 9% of total online sales by the start of 2017. That’s a $31 billion market, compared to the $8 billion M-Commerce brought in during 2012. So despite its current, modest numbers, M-Commerce is on track to quadruple in scope between now and 2017, those are numbers many businesses will jump to get behind. As more and more Americans prefer browsing the internet from a mobile device versus a desktop or laptop, we can only see this trend continuing. The takeaway message: if your business is creating a mobile app or web app, put some thought into M-Commerce. Turning your mobile presence into a virtual storefront is too good a prospect to ignore, and factoring in a 33% increase in the M-Commerce market, you’d be hurting yourself not to check out what all the fuss is about.